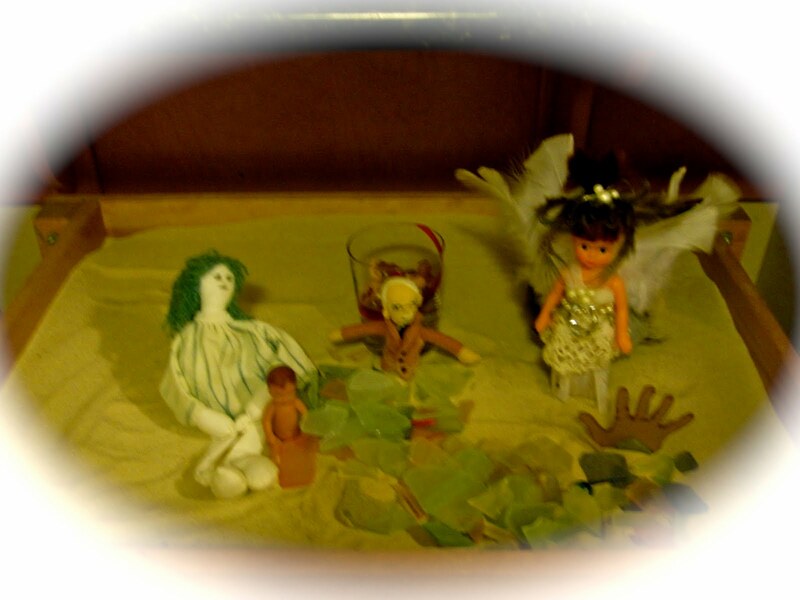 A Sandtray in therapy, is multidimensional experiential therapeutic tool. In a tray of dry and/or wet sand clients build worlds. Using miniature objects, natural objects, dolls, cars, shells, dishes, and others things that represent all the bits and pieces of things that make up our everyday world, they create scenes and pictures in the sand. These scenes made by adults and children may reflect what home, work, the playground, the bedroom, a friends house or many other places may look and feel like. There is the unmistakable feeling of playing as a young child in beach sand, but also of being a giant in a world of miniatures. We can shape new images, recreate old memories, express feelings and if we need to destroy what we just made. We can connect and reconnect with imagery through the diverse ways of playing within it. From this new perspective we can plan new futures and revisit past experiences. Historically, it was Margaret Lowenfeld, a child psychoanalyst in London, U.K. who pioneered Sandplay in her therapeutic work with children during the 1920s. 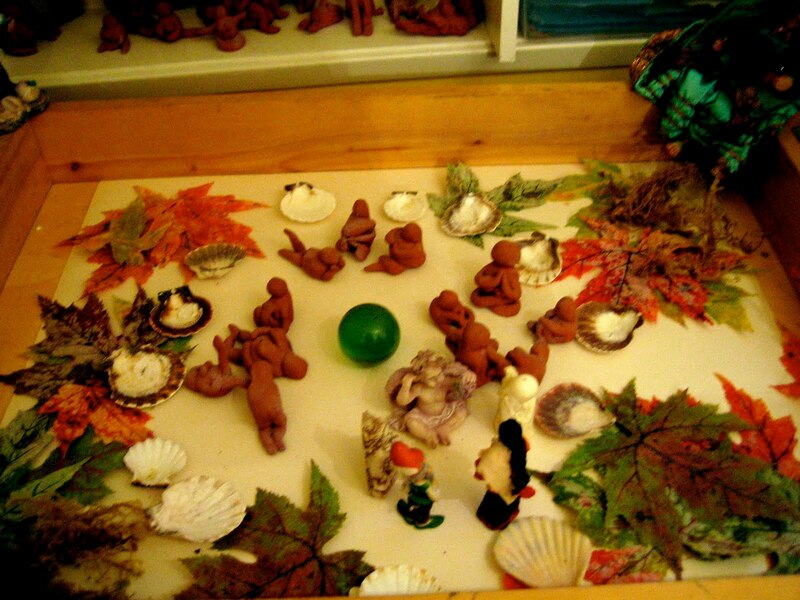 The therapist has an collection of miniatures for clients to work with. These maybe bridges, ships, people, twigs, rocks, flowers, cars, food, fantasy creatures, spiritual figures and many other things. They then make a scene with their collection in the sand maybe after a visualization, talking, doing a focusing session or a painting. A whole family could recreate the conflict that they had last night, a female client may express her confusion when her boyfriend cheats on her and a child may show what his new blended family looks and feels like. Sometimes client may re-experience pre-verbal states, sometimes they can use the sand to make cognitive decisions and or to reconnect with a felt sense. This is a very open ended, free, nonjudgmental way of working with figurines, objects, ideas and feelings. The therapist may be the witness to what happens for the client by holding space and being quiet, may ask questions and guide or be part of the creative process by also building. Client by communicate with the figures, write a story, poems, explain to the therapist what is happening or remain silent. Sometimes the client talks about her life issues. Clients may want to interpret what they have created or keep it in process and not talk about meaning. As with working in other mediums and with other techniques in art therapy, what happens is what needs to happen for each individual client. 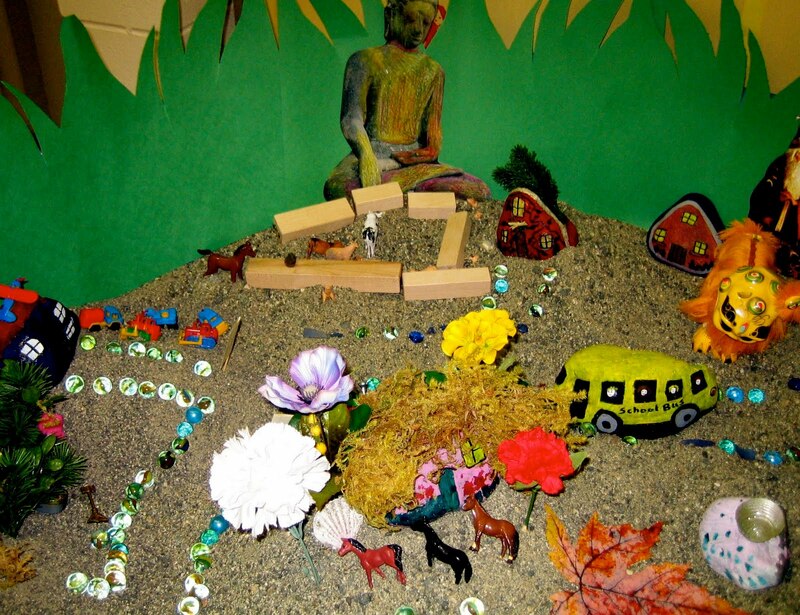 Sandtray image: A child's village where an accident happened and a friend was killed. This is really interesting; especially once you see it applied as in the child's village. Thanks for sharing! Yes, the image really gels the process description.. I wonder if alot of art is just like that..